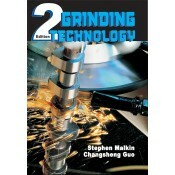 Presenting a comprehensive and consistent treatment of grinding theory and its practical utilization, this new edition focuses on grinding as a machining process using bonded abrasive grinding wheels as the cutting medium. Logically organized, this self-contained resource starts with a description of abrasives and bonded abrasive cutting tools; then moves on to thermal analyses of the grinding process for conventional, creep feed, and superabrasive grinding; and ends with methods for enhancing and optimizing of grinding operations, simulation of grinding processes, and computer control of grinding machines. The perfect reference for practicing engineers involved in the grinding process, it will also be useful to researchers working in the field. • Features a unified and self-contained presentation about what is known about grinding processes and how this information can be practically applied. • Presents more detail on new grain materials, creep feed conventional abrasive wheels, superabrasive (diamond and CBN) materials and wheels, and metal bonded superabrasive electroplated wheels. • Includes a more comprehensive treatment of thermal aspects of grinding; as well as a new chapter on dealing with fluid flow in grinding—including flow through the grinding zone, fluid burnout, and cooling effects. • Contains an updated chapter relating to grinding machine control and optimization with a new example of model-based grinding optimization, and future prospects for integrating simulation into open architecture machine tools for optimal control. • Grinding Wheels: Composition and Properties. Grinding Geometry and Kinematics. Wheel, Truing, Dressing, and Topography. Grinding Mechanisms. • Thermal Aspects: Conventional Grinding. • Thermal Aspects: Creep-Feed Grinding. • Thermal Aspects: Grinding with CBN Abrasives. Fluid Flow in Grinding. Surface Roughness. Wheel Wear and Lubrication. • Grinding Deflections: Grinding Cycles, Inaccuracies, and Vibrations. Simulation, Optimization, and Intelligent Control.